Recently, my friend Eric has become obsessed with seeing movies. Whenever he gets a free Saturday, he heads off to the movie theater and stays for at least two shows. His movie-going practices have made me want to see more movies also, yet I just don’t always have the time (or money) to go out and see everything Hollywood has to offer. I feel like many people are bound by the same time constraints as I am, which is why Netflix has become so popular. However, some people aren’t into mainstream, popular movies. And that’s okay, because now, Fandor is available. Fandor will use social networks to attract larger audiences to films from independent producers, who typically do not have the multi-millions available to large production houses to distribute their movies via DVD. For $9.99 per month, subscribers will be able to stream movies found only at film festivals or during limited-runs at art houses into their homes over the Internet. The co-founders of the site, Jonathon Marlow and Dan Aronson have both been interested in indie films and decided to combine Marlow’s technological background with Aronson’s film festival programming experience. According to Fandor founder and CEO Dan Aronson, these films are “the best movies that people haven’t heard about.” So if you’re a movie buff and want to try something new, check out this unique start up today! Last Friday, I traveled to California for spring break to visit my friend Catie who is interning in San Diego. I had an amazing time: I got to run along the beach in San Diego, go on the rides at Disneyland (my favorite was Indiana Jones, you get to ride in a jeep! ), mingle with Californians at local San Diego bars, walk up and down Hollywood Boulevard, ride the ferris wheel in Santa Monica and drink multiple margaritas in Old Town. It was, by far, the best spring break I have ever had. While I was staying with Catie, she told me about all the great deals she had been buying through Groupon, a startup that offers daily deals on food and services in cities across the country and throughout the world. Through the site, visitors can buy great deals at discounted prices, such as 50 percent off at restaurants or pay $10 for $20 worth of merchandise on Amazon.com. So far, Catie has purchased a hot-air balloon ride at half-price, a sky diving session at half-price, and a discounted pedicure. While I have used the site before, I never really thought of it as a startup because it got so popular so fast. However, once upon a time, Groupon was just an idea in the mind of an entrepreneur. That entrepreneur was Andrew Mason. In 2007, he started a company called ThePoint, a platform that allows users to create donation campaigns for different causes. The website allows users to pledge money, providing their credit card number and information, yet no money is actually donated until a certain “tipping point,” or number of people joining the campaign, is reached. The idea of “collective action” inspired Mason to create a small WordPress blog in fall 2008, named Groupon, that was powered by ThePoint and provided daily deals, like the deals the site promotes today. By summer 2009, Mason and his team shifted their focus to Groupon due to the rising success of the site. While ThePoint did not gain the recognition Mason had hoped, Groupon took off. Today, Groupon is among the most popular startups in the world. The company made group-buying a worldwide phenomenon in just two years, and expanded to 1,600 employees and increased its value to more than $1 billion. 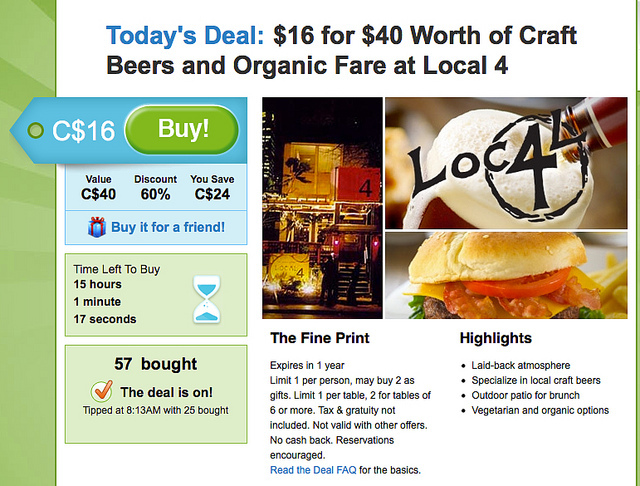 Now, there are many other sites mimicking the idea of collective buying, such as LivingSocial, Dealster, and BuyWithMe. Check out this article, where Mason gives some advice regarding startup companies. And in the meantime, check out Groupon for some great deals! Many college students are accustomed to using Facebook, the social network site created by Mark Zuckerberg during his undergraduate years at Harvard University, for keeping in touch with friends, sharing pictures and creating event invitations. No longer are formal calls or hand-written cards necessary–Facebook does all that work for you. Today, older adults and professionals are also using Facebook for their own personal or professional needs. My mother (who, no offense, is not the most technologically-savvy person in the world) even uses it to get in touch with friends from high school and college. The fact that being “friends” with me on the site means she can check up on what I’m doing at anytime is just an added bonus. One entrepreneurial business I have been following is Brewspy, a website created by Northeastern student Tyler Smith, a senior finance major. Brewspy.com features bar deals and discounts throughout the Boston area, helping college students to reduce the financial strain of going out in an expensive city. The Facebook page for Brewspy is proficient and professional, yet keeps a fun, personal feel at the same time. The Facebook page includes a brief description of the company’s cause, and links to Brewspy’s Twitter page and the company’s home page. I think it’s a perfect example of how entrepreneurs and young professionals can use Facebook to publicize and brand their business–Brewspy’s Facebook page has 1,830 fans, making it a perfect place to promote company news and information.